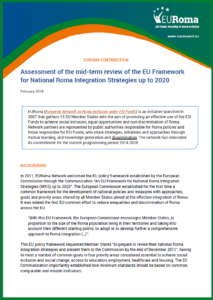 Read about EURoma’s contribution to the mid-term assessment process of the EU Framework for National Roma Integration Strategies (NRIS) launched by the European Commission. EURoma closely follows the discussions on the future of the EU Framework for NRIS and actively contributes to them based on Network partners’ experience and ongoing reflection processes within the Network. The creation by ESI Funds Regulations of an increasingly favourable framework of opportunities and tools to promote social inclusion and non-discrimination of Roma. Main advances include the introduction of elements such as the specific ESF Investment Priority ‘Socio-economic integration of marginalised communities such as the Roma’ (IP 9.2. ), the ex-ante conditionalities and the stronger linkages with the political priorities identified in the Country-Specific Recommendations. However, further efforts are required to bring about a tangible change in the lives of the European Roma. Using ESF Investment priority 9.2. and beyond; ensuring the effective implementation of the actions planned in the programming documents: or using other funds such as ERDF, EAFRD for Roma inclusion. Using the combination of funds. Mainstreaming Roma inclusion in ESI funds beyond ESF. Fostering the alignment, complementarity and coordination between the NRIS and ESI Funds and among other key policies and administrative levels is also key. Furthermore, National Roma Contact Points should have a pivotal role and should be given the adequate human and financial resources as well as the necessary competences to fulfil their tasks. Achieving quality participation, involvement and performance of relevant stakeholders for Roma inclusion remains of high importance. Finally, the European Commission has a key role to play in driving progress in all these areas by strengthening monitoring of compliance, providing guidance and support and encouraging alignment between policies at European level.